The snake in our game needs a place to live, a level. We define a two-dimensional grid on which the snake is allowed to move. The grid has certain dimensions defined by columns and rows properties. Each cell of the grid is occupied by a certain tile. Two basic tiles are the empty tile and the wall tile. The snake can move on empty tiles without any problem, but when it tries to move into a wall tile, the game is over. We define a Level class below. The level has a two-dimensional grid, an array, of a certain size. The tiles, the cells of the grid, have a certain tilewidth and tileheight. We initialize the array of tiles to 0, which means that all of the tiles are the empty tile. We need to generate an actual level by adding the generate() function to the Level class. The level we generate below will simply have an open area of empty tiles, while the borders of the level are wall tiles. A wall tile is defined by the number 1, while the empty spaces are defined by the number 0. To create a more interesting level, you could hand-craft the level array and load it when the game starts. The snake needs to be able to move in a certain direction. When the snake eats something, the snake needs to grow. We create an init function that initializes the properties of the snake. The body of the snake is represented by an array of positions. Check out the comments in the code below. Moving the snake is the most interesting part. When the snake makes a move, all of the segments of the snake body need to be updated. The basic concept is that every tail segment is moved to the position of the previous tail segment. Finally, the head is moved to the position of the next move. The order of the segments is important here: segments represents the head of the snake while the next segments represent the body and the tail. 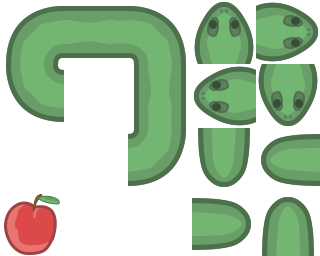 We draw the snake by first creating and loading a sprite sheet, also called a texture atlas. The sprite sheet is a single image that consists of multiple smaller images, that represent parts of the snake that get composited later on. In my article How To Load And Draw Images With HTML5 Canvas you can see how you can load the image. The sprite sheet that you can see below shows all of the sprites that we will be using. You can see The different snake parts in all of the different directions. Finally, you can see the sprite for the apple. All of these sprite images have a resolution of 64 by 64 pixels and have a transparent background. When we draw them to the screen, we will scale them to fit our game. To draw the snake, we have to connect the right sprites to each other. We want to draw a head, than parts of the body and finally a tail. They have to be drawn in the right direction as well. What we have to do, is create a big conditional statement and check all of the cases. The code below calculates the snake parts that need to be drawn to the screen. The tx and ty variables that are determined, are column and row indices in the sprite sheet. We use drawImage to select a part of the sprite sheet and draw it to the correct position on the screen. The result of the drawSnake function is a seamless snake on the screen that is composited of multiple sub-images from the sprite sheet. 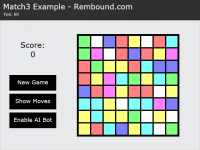 Creating the basic game loop is already explained in my tutorial How To Make An HTML5 Canvas Game. Our game logic builds upon this basic game structure. Let’s start by creating the snake and level objects and starting a new game. We initialize the snake at position 10, 10, facing to the right, at 10 blocks per second with a length of 4 body segments. The level is generated and an apple is added to the level. The apple is a food item that the snake can eat to grow. We have to create the addApple function. We need to add an apple to the level, but we only want to add the apple at an empty position. 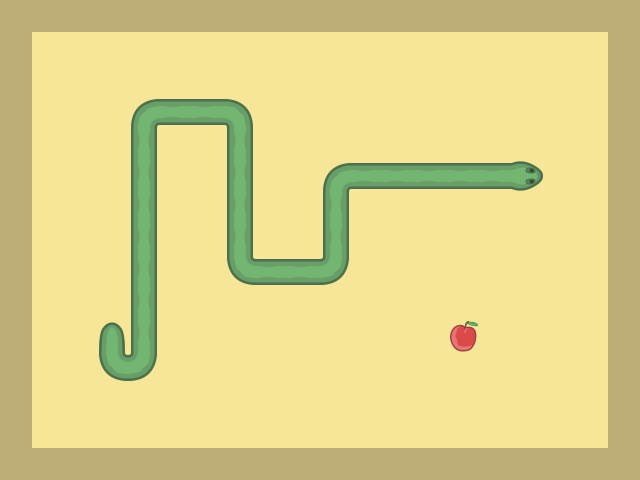 We don’t want to add the apple at a position where the body of the snake is or where there is a wall in the level. The code below finds a random valid position. If it can’t find a position right away, it keeps trying. For the code to work efficiently, there should be enough valid empty spaces left. Moving the snake inside the level and checking collisions is done in the code below. When the snake collides with an apple, the snake grows and a new apple is added to the level. Check out the comments below for more information. Here you can play the finished Snake Game that was created in this tutorial. The full source code is available on GitHub, licensed under GPLv3. 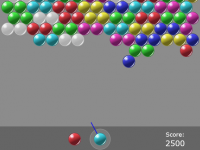 Move the snake by pressing the arrow keys, wasd keys or by using the mouse button. As a bonus debug feature, you can grow the snake by pressing the spacebar key.